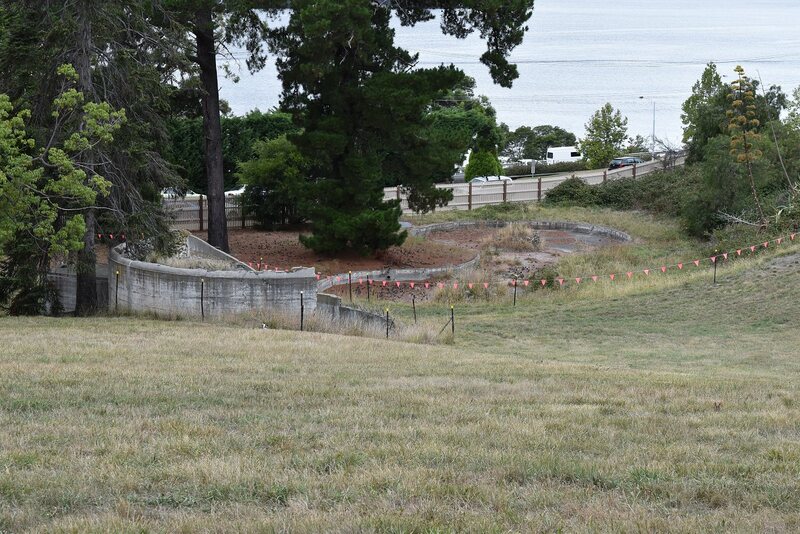 This is the site of the former Beaumaris Zoo, on the Queen’s Domain in Hobart. 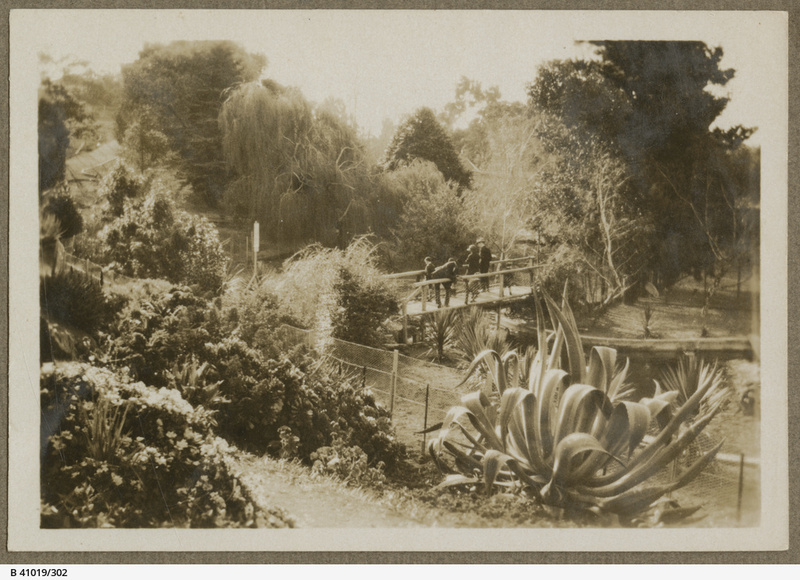 The zoo was first established as a private collection in a garden in Sandy Bay, that the owner, Mary Roberts, opened to the public. 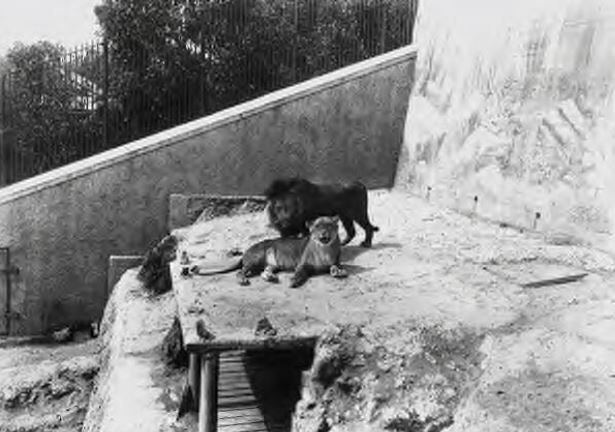 When she died in 1921, the zoo was gifted to the city, and moved to this site on the Domain, where it was opened two years later. You can read that bit here. The Beaumaris Zoo opened here in 1923. In its early years it was a popular outing for the people of Hobart, but in the 1930s, the Great Depression led to falling attendance and rising financial losses. 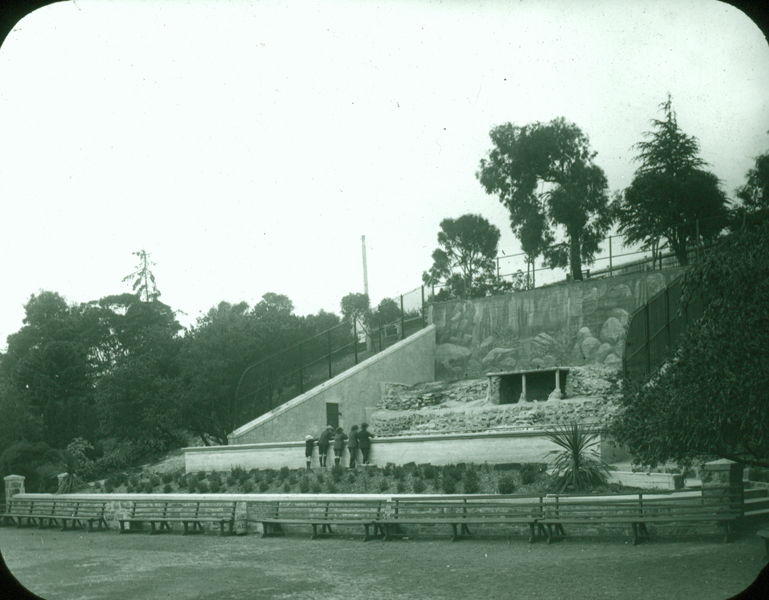 The zoo closed in 1937. 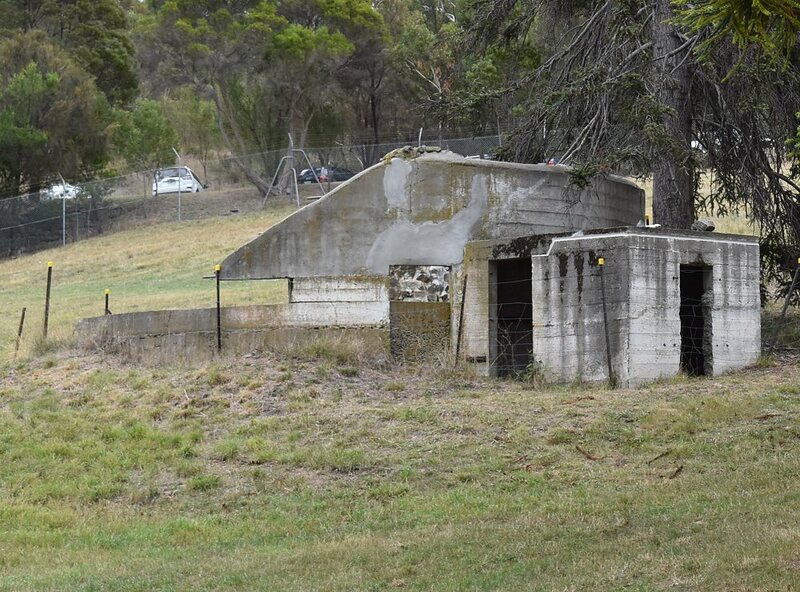 In 1942, the Royal Australian Navy converted the site in to a fuel oil storage depot. 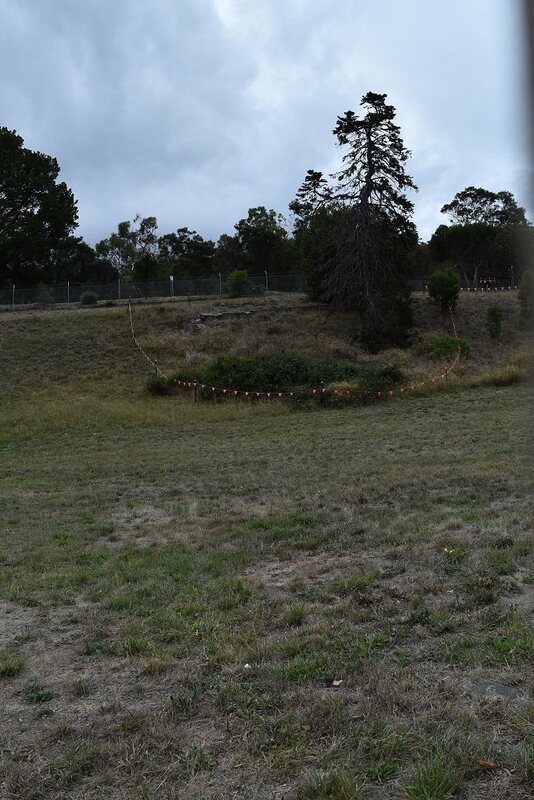 It remained in use until as recently as the 1900s, when the four storage tanks were removed. but they’re not the original main entrance. This end of the site is the most interesting, as it has the most obvious remains. Looking down from the top road (the gates are behind the tree in the middle), you can see the polar bear enclosure and the duck pond. And there’s the duck pond, again, and the leopard enclosure. So, the gates give the best view of the interesting bits. Here, the duck pond and leopard enclosure again. And the polar bear enclosure. There’s a photo on Wikimedia Commons that shows that from other (front) side. 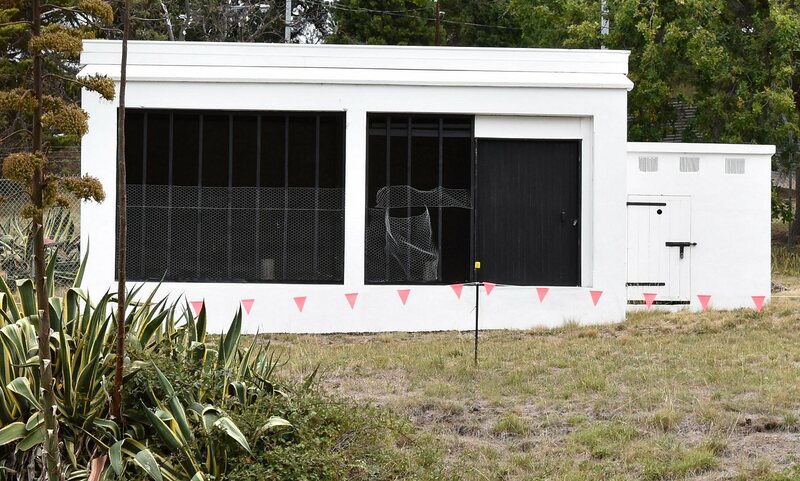 Zoo security at Beaumaris was not always perfect. 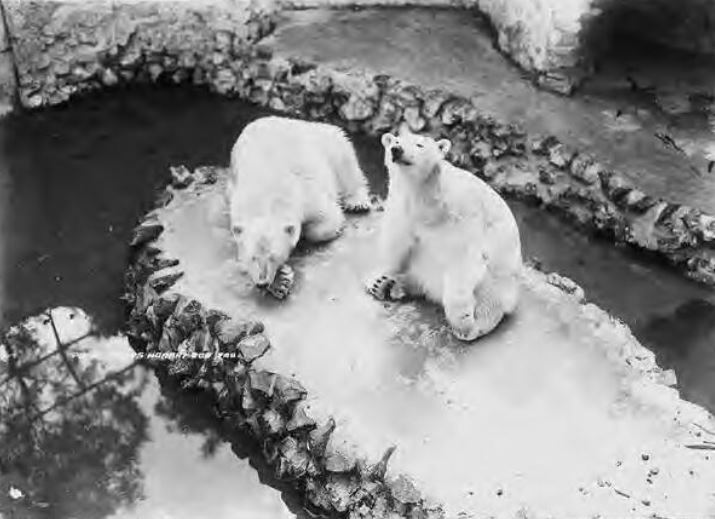 On a January afternoon in 1926, one of the polar bears leaped across the moat and came within an inch of clawing over the bars — the island inside their enclosure was quickly lowered. 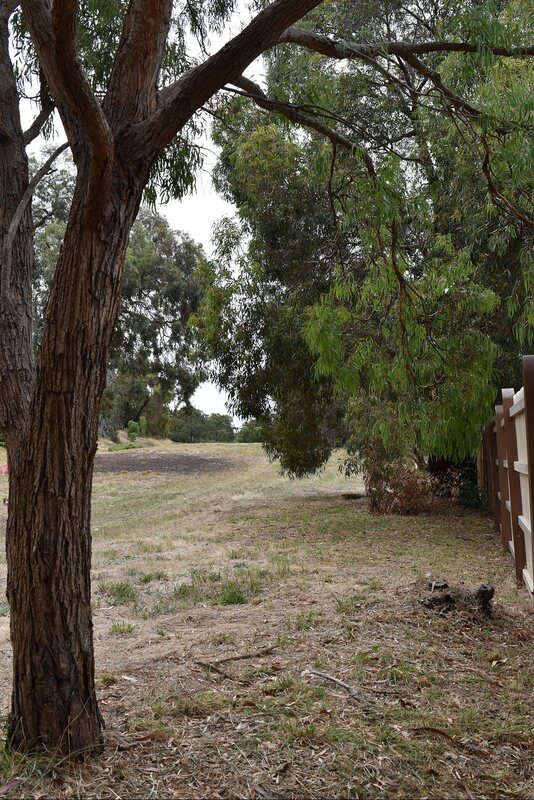 The rest of the site is mostly trees and grass. 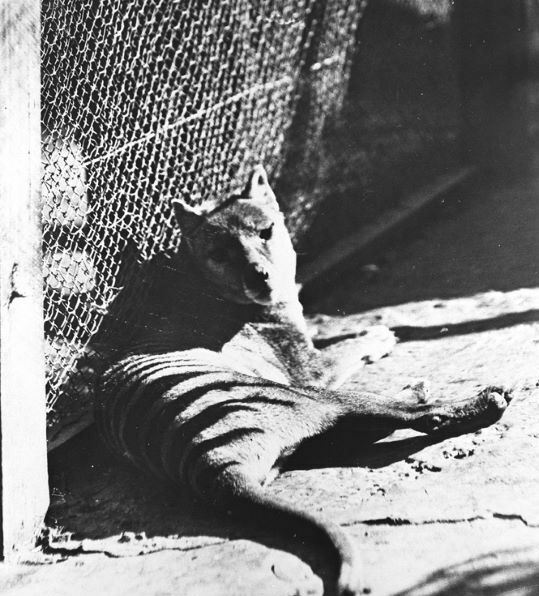 From the QVMAG collection, “View of a Thylacine at the Domain Zoo Hobart Tasmania, 1927-1929” (QVM:1983:P:1943). 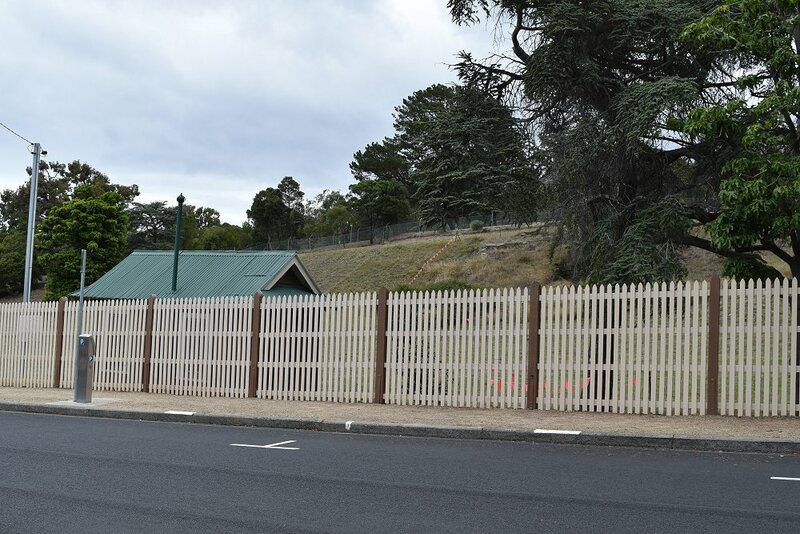 The lions’ den was directly opposite the original entrance, 100 metres further along towards the Botanical Garden. Let’s move along a bit then. 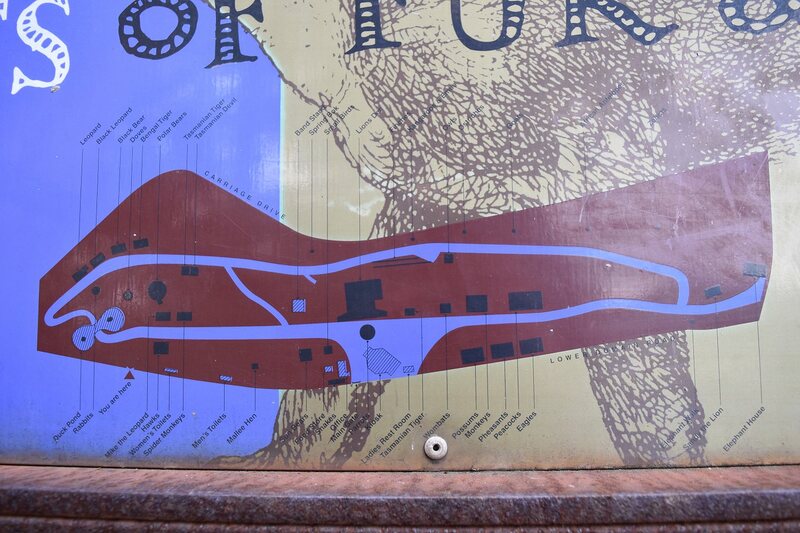 As best I can tell, the lion enclosure was about here. 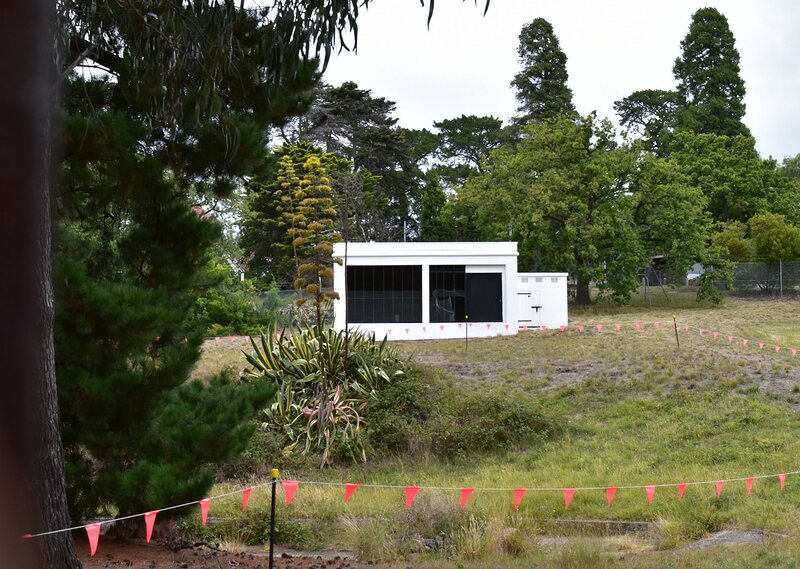 This photo from QVMAG shows the area around the main entrance (off to the left), with kiosk on the left and the lions on the right and a bird aviary in the middle. 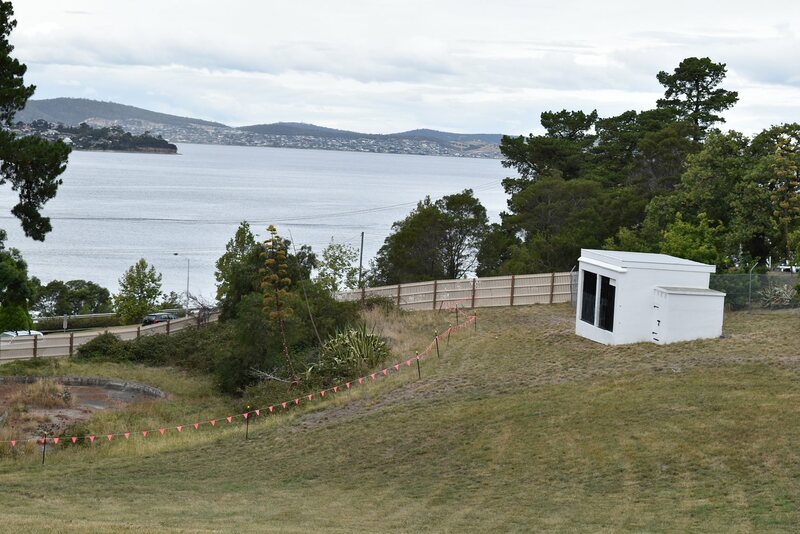 This photo from the Tasmanian Archives & Heritage Office shows the same view from the other direction. 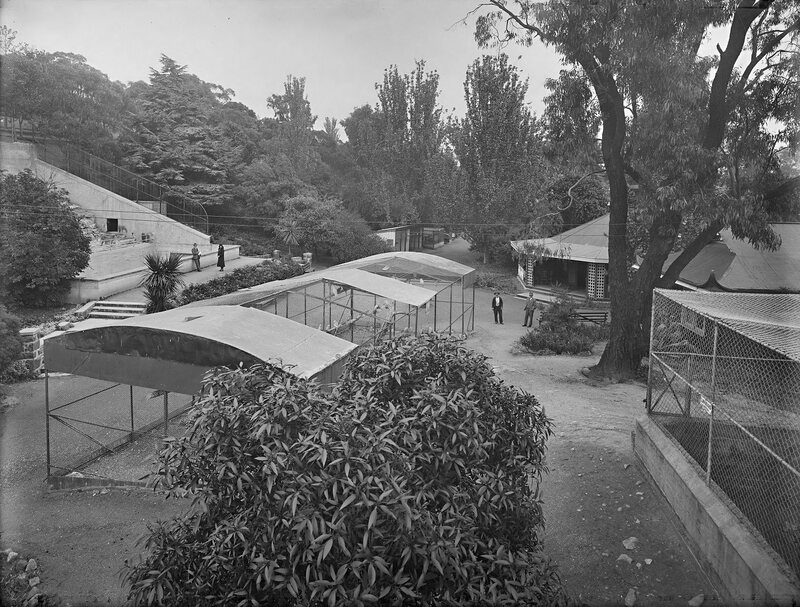 With the lions on the left, the aviary in the middle and the kiosk behind the tree on the right. That cage on the right is the Sun Bears. The Sumatran sun bears also caused some excitement. Swapped with Chapmans of London for four Tasmanian devils, two eagles and four wombats, these creatures of the tropical reainforest lived in a cramped, poorly-drained cage. At different times, both escaped by tearing the wire with teeth and claws. In one of the incidents, a keeper was severely bitten when he tried to force the animal back with a pitchfork. Nr Newman never recovered from the injury–he died soon after returning to work. The sun bears’ fate was decided more quickly — roaming free on the Domain, they were shot by police. 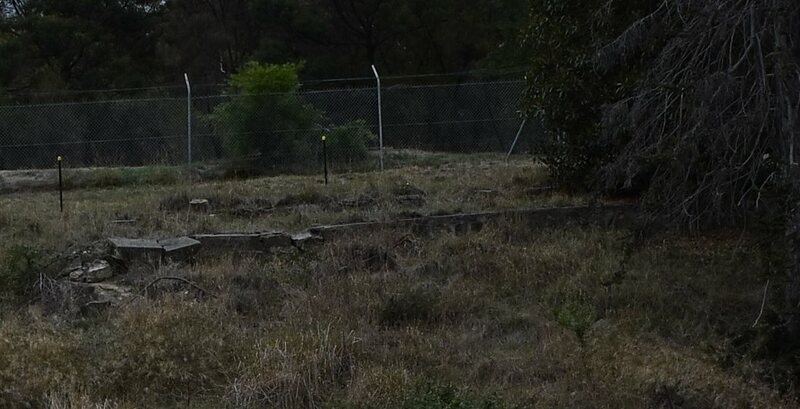 So if you’re ever down on the Domain, passing this fence, you can stop and think about the polar bears and lions and the poor sad sun bears breaking out and running free through the gun trees.